My First Maternity Stitch Fix Box! 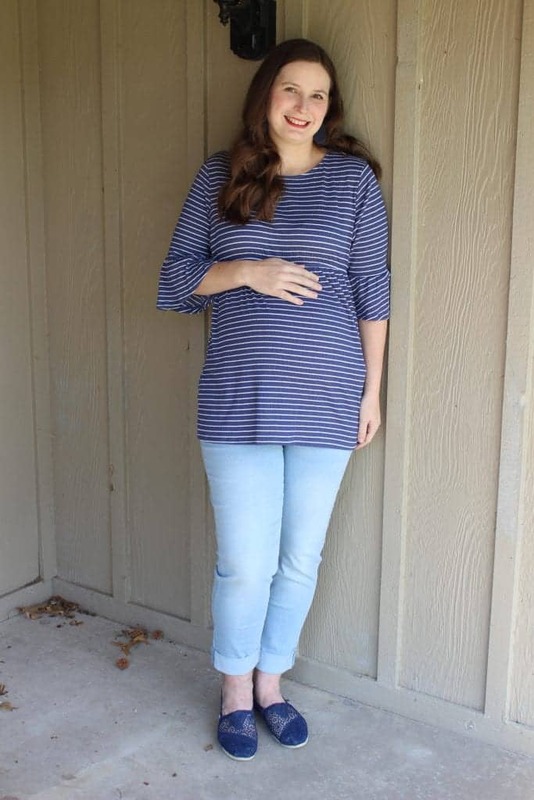 After using Stitch Fix for several years I finally had a chance to try out my first maternity Stitch Fix box! I honestly can say this is the first box that I was really tempted to keep every single item, but sadly my budget didn’t allow for it this month! I seldom get out to go shopping in stores for clothes. Every great once in awhile my sister and I go out together, but I just don’t have the time to be out shopping a lot besides groceries. That’s why I appreciate Stitch Fix so much, it’s good quality items that I can try on in the comfort of my home. If you are not familiar with Stitch Fix, here is how it works! First thing you do is fill out your style profile. 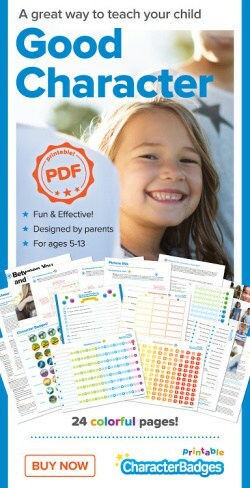 This gives your stylist ideas on how tight or loose you want your clothes, want pricing, sizing, and color preference you have. This is also the place you link to your fashion board on Pinterest, so your stylist gets an idea of what you like! I have a board just devoted to pinning Stitch Fix items. Now you just order your fix! You have to pay a $20 styling fee, but that fee is refunded if you end up keeping any item in your box. I always keep at least one thing, so I don’t blow through $20. Every box comes with 5 items. Stitch Fix offers clothes, shoes, accessories, jewelry, but you can specify what you want. I don’t have anything checked on my profile beside clothing, but I might try the shoes and jewelry section next time. The box will show up in a few weeks (you can schedule when you want it to arrive, but it normally takes around 2-3 weeks for the stylist to put together you box, and it to arrive). You have 3 days to try everything on, and decide what you want to keep. 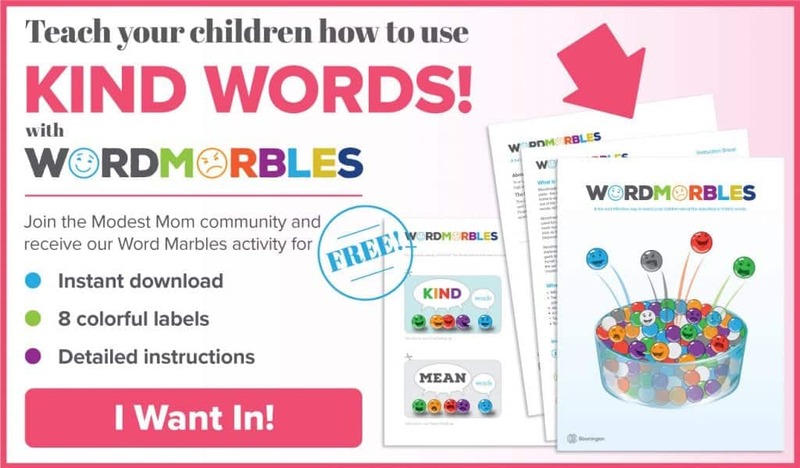 A postage paid envelope is included, so it’s super easy to send back! If you keep all 5 items, you get 25% off your order! A new stylist put this maternity Stitch Fix box together for me and she did an awesome job! Liverpool – Belinda Maternity Skinny Crop Jeans $88.00 or $66.00 with 25% off. I seriously love these jeans! 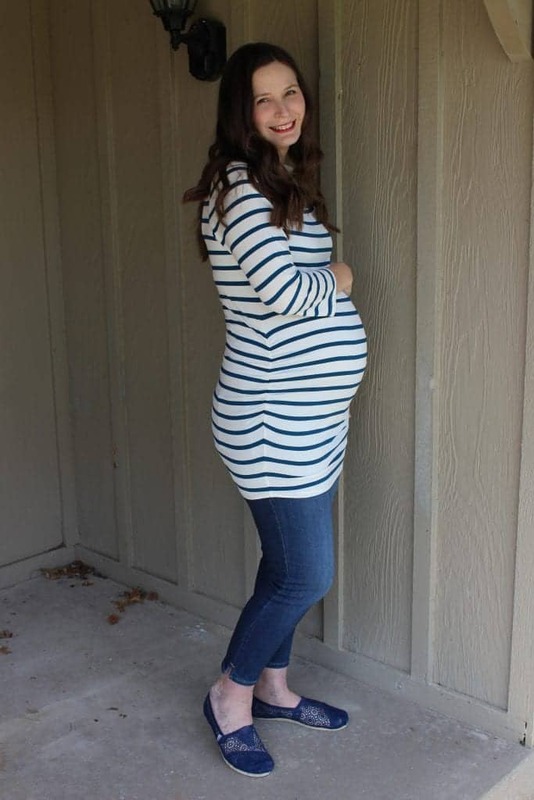 They are the most comfortable maternity jeans I’ve tried on, but I’ve noticed that all the jeans that Stitch Fix sends out are super comfortable, just on the more expensive side. If you are comfortable investing in just 1 or 2 good pair of jeans, this might be the way to get a pair of jeans that finally fit you just like you are hoping for! The full maternity panel was just what I was hoping for. Honestly the only reason at all I didn’t keep them was I just couldn’t work them into my clothing budget this month! The top I’m wearing is from Old Navy, I like that it covers the jeans to a length I prefer and that it isn’t a tight shirt in the back. Just Black – Peyton Maternity Capri Jean $78.00 or $58.50 with 25% discount. This is the other pair of jeans my stylist sent along. I tried them on the first time and thought they felt a little tight, but when I tried them on the second time to take this picture I think they were ok. I like the color of these jeans and the quality once again feels really good. This shirt was a winner! I love polka dots and I love navy blue, so as soon as I pulled this shirt out of the box I knew I wanted to keep it! It’s a soft material that is really comfortable. The nice thing about this shirt is that I can see being able to wear it after the baby comes during postpartum time, since it’s shirred on the side instead of having ties that make it definitely look maternity. 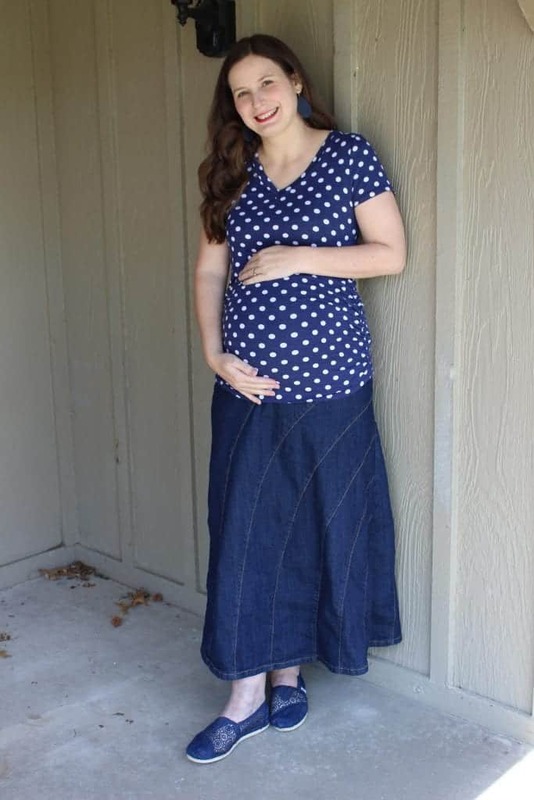 I’m wearing it with our Rainbow Denim Maternity skirt found on Deborah & Co.
Loveappella Maternity – Charlote Ruched Side Shirt $48.00 or $36.00 with 25% off discount. This is the only shirt I wasn’t totally sure about. I really like it, but it’s a fitted tunic so I would need to either wear it with a maternity pencil skirt or wear it over jeans. I don’t mind wearing a tunic length top over jeans but this one is fitted so I’m not sure if I felt ok wearing it over jeans. What do you think? Would you feel comfortable wearing this tunic shirt over jeans? It’s just totally different then what I normally wear! Full Moon – Naome Maternity Graphic Knit Tee $38.00 or $28.50 with 25% off discount. I love the color of this shirt and of course I love the smile saying! I was tempted to keep this shirt over the polka dot one, but the combination of navy and polka dots tipped the scale. 🙂 Since I have to go through a pregnancy in July and some of August I wasn’t sure about the quarter length sleeves as well. If you want to order a Stitch Fix box to try, go here to request a box and fill out your own style profile! They are so much fun to receive and you can request all dresses, all skirts, all tops…the options are endless! 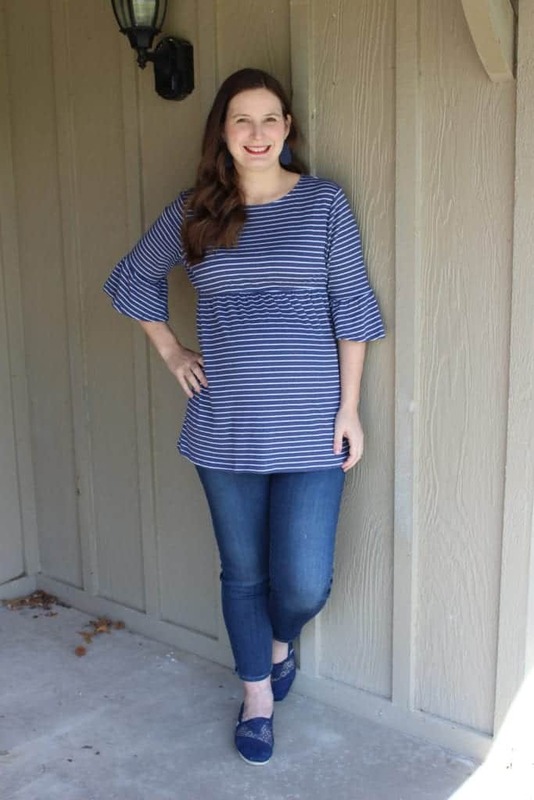 Besides offering the maternity Stitch Fix boxes, they offer sizes for women and plus sizes. You can see some of the other Stitch Fix boxes I’ve received below! 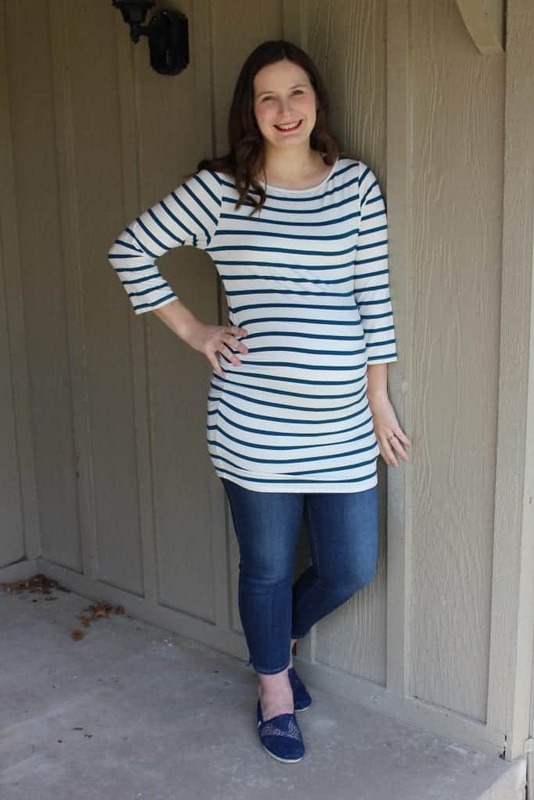 9 Comments on My First Maternity Stitch Fix Box! Hi, Carolyn. Wow, you are so cute pregnant. And you look so great in jeans! I like all of these items except the striped tunic shirt. But maybe that’s because I just don’t have the kind of figure where that style would ever look good! Lol. Looks cute, I didn’t realize you were pants. I thought I remember reading an article that you wrote on how you only wear skirts and all the reasons why. Did you recently change your mind on that stand? 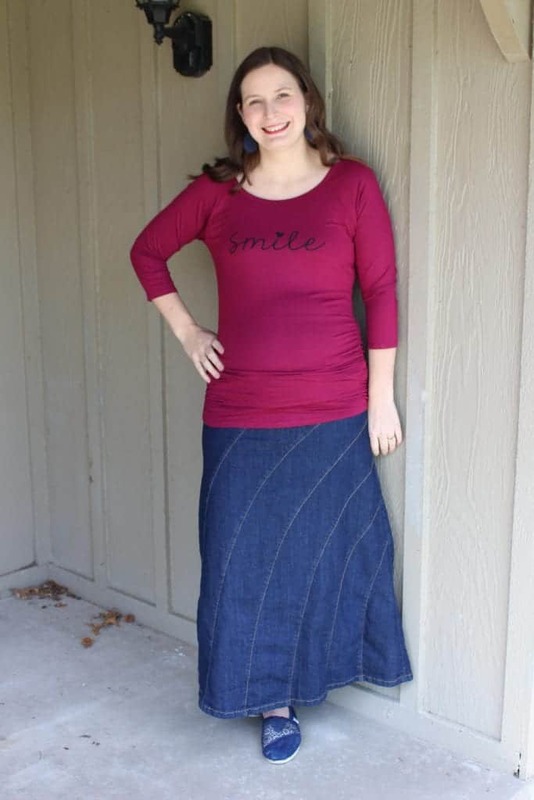 The dark jeans and tunic were my favorite! They looked great on you! Love the polka dots as well, good pick. I love your Old Navy shirt. Apparently it’s not a current style though? I looked on Old Navy and didn’t see anything like it. I tried looking as well and I couldn’t find it. :/ I bought it just a few months ago! Love the blue polka dot shirt! I wasn’t crazy about the tunic top. The cut looks SO much like a dress. Wow, you are so cute pregnant. And you look so great in jeans. Not only jeans your all maternity collection is looking awesome. Can you tell me from where you buy these? Thanks in advance for your answer.